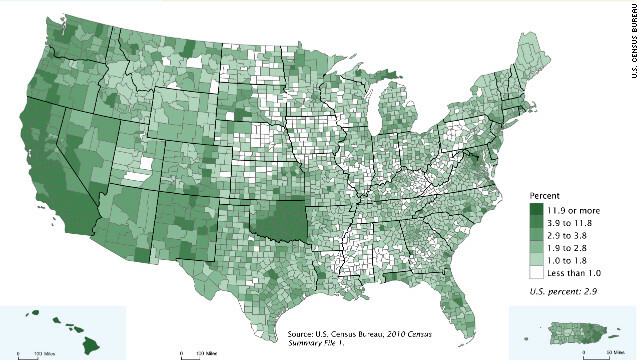 The census map shows America's multirace population as a percentage of county populations. (CNN) - Before 2000, you had to pick one: White, black, Asian, American Indian, Alaska Native or some other race. But now you can tick multiple boxes on the U.S. Census Bureau's race category. Elizabeth Warren: Is she, or isn’t she Native American? The largest multirace groups in the 2010 census were white and black (1.8 million); white and “some other race” (1.7 million); white and Asian (1.6 million); and white and American Indian and Alaska Native (1.4 million). What do you think imigrations long term plan was, to do exactly that. umm, no. Modern science most certainly does not agree on that. In fact, the genetic evidence is clear that there were never fewer than around10,000 human ancestors at any time, and that humans evolved gradually from other primates over the course of millions of years. Please educate yourself. According to a Pew Hispanic survey, 36% of Latinos identify their race as white. Remember, Hispanic/Latino is an ethnicity, not a race. No one is solely African American you moron...they are both African and American as their name implies. when did Americans stop learning reading comprehension? After thousands of years walking the surface of this earth, claiming to be of a pure white race or black race could be totally unfounded. Maybe the Maori in Australia before the British porked it all up, or the lost tribes in Brazil, the Africans way deep in the jungle, the nomad tribes in central Asia could be a genetic treasure of the human race. But Arians and Blacks living in the Americas are already kind of diluted. As for us the Hispanics, proudly carry on our genetic mix made up of native American and Spaniard or European bloods, at least. Of course, many of us can also brag about our African ancestry. Yes sir. I hear you, Cacique. I drive through the black neighborhoods with my white skin and Spanish face, playing my Salsa while I laugh at the haters who give me dirty looks, not knowing that my father's father was black and well off in the Caribbean. I go home from work, and kiss the "india" who gave me my beautiful children and serves me a delicious plate of garlic yucca and stewed salt cod, a mix of foods with Native American and Norwegian roots that is part of my heritage. At work, I smile inwardly at the Anglos who leer when they hear my last name for the first time, not knowing that were it not for the military aid of my Spanish creole ancestors, George Washington would have lost the state where they live. I know who I am, I live it, breathe it, taste it, hear it in my favorite music, and I LOVE IT. Hispanics are white Europeans my friend. not a mix of euro and west Indian blood. Hispanics are people from hispania ....which means Spain. Im cherokee and Irish and there is no special racial same for me. Although i do prefer my keetowah roots and culture to my Irish roots...and why...because this is not Ireland its America. Wrong again Hispanics are multicultural and we have african and european blood which is what makes us so damn gorgeous! Right on Maria. Hispanics are all mixed, we have blonds, red heads, blue eyes, green eyes, brown skin, white skin and black. We are everyone in one. I find it hilarious that these "race" boxes exist when in reality it has nothing to do with race but skin tone. I say for every census we hold out or arms and have our skin tone determined Home Depot style. Then maybe the absurdity of this crap will be realized. Now that Warren is a Native American, because someone in her family wrote a "biography" that says she is, we can all be anything we want! few more of these and they can knock out the white race box! not in the Ukraine though! Here's an idea, how about we stop having the census ask about our race. If we are truly going to achieve Dr. King's dream of a world where we judge the content of a man's character rather than his skin color then we will need to stop worrying about a person's skin color. there should be ONE box to check...HUMAN race. Whoever started this race thing way back then was beyond syupid ! there was,is now,and always will be one race:HUMAN you are exactly correct! Or who they can BEST identify with, I guess. The average American cannot identify with the current lifestyle of anyone in political office today, Obama and Romney included. ...the US race to the lowest denominator accelerates. That's a rather ignorant post. People tend to vote for who they identify with so its no surprise that many blacks vote for Obama. Its not racism. More Latinos probably bought Selena records than Madonna records. Is that racist? No. People of all races gravitate towards situations or people they can relate to. That is why Republicans generally vote for republicans and Democrats generally vote for Democrats. Its racist ONLY if white people dont embrace and buy black and Latino people stuff. We have to have their culture rammed won our throats but they can keep staying with their own ways. Thats how it works. From the map, it looks like the most racially "pure" state is Mississippi. Gerry O'bama, really? African Americans have been voting in those numbers for Democrats for years, but I guess that didn't bother you as much since until now, those votes were for white men and if you think most are unaware that the president is mixed you need to crawl out from that rock and get a clue. I think it's time to do away with the race question. We'll all be better off when we can simply identify ourselves as Race: Human. didn't see your post...great minds think alike! In this country it doesn't matter if you are "mixed" people only see us as black; just axe The President. Yep. One drop rule definitely still applies in this country, although application of it varies state by state. Could use please cite an actual time when anyone from the republican party has referred to people of mixed race as "mongrels"? Or is that just something you believe republicans say because it makes it easier for you to hate them? In reality leaders do not want an educated, armed, and united populace becuase they resist tyranny and dictatorship. They use left right, race, have's and have nots, etc to seperate us from each other. They have dumbed down schools and denied our republics history. They keep us fighting. They want our guns. Then why did Obama choose Black and say there was no place to check bi-racial? The story says 2010 census. Why do bi-racials, choose to be black when it helps them? I know of a person who chose black to get help to get into college. One drop. Soon and very soon the generation that hate produce, the so called "baby boomers" will all be dead in hell somewhere and peace will reign in America. We will be able to get along in about twenty years. Thats crap! People base what color you are on how you look. Checking Black doesn't give you anything more than checking hispanic or white.. get a clue! Actually, Obama has not chosen Black, he chose African-American. Obama knows that he is not going to get many votes if he states that he is Mulatto. However, he knows that by being the son of an African father, and an American mother, he can put down African-American and no one will question it. On the very first interview that he gave as president, he stated in his own words that the dog he was looking for "must be a mutt like me". On your second point about bi-racials choosing Black to get into college. They do so because it is convenient, it is only one piece of paper, that is going to help them get a degree, however, in their private arenas they know that they are mixed race. I thought all of us are american?? Why the silly race classifications. I thought King Had a Dream? King didn't want skin color to be an issue. Now the hand out crowd hyphenates their American status, fly oppressive foreign flags, and does their very best to not fit in Americana. Now Jim, when you say hyphenated crowd, are you referring to Irish-americans, italian-americans or german-americans? Because I've seen those terms a lot. I guess you didn't get the memo that the majority of the 'handout' crowd are of european decent. Or don't you care to know the actual facts and numbers? "I guess you didn't get the memo that the majority of the 'handout' crowd are of european decent. Or don't you care to know the actual facts and numbers?" If two groups receive handouts and for every 10 of one group there are 70 of another group, the larger group will probably receive more handouts, even if by percentage they receive less handouts. Your real error isn't the misleading statistics barely hiding your prejudice against a particular racial group. It is in dividing the human race into racial groups and assigning them separate attributes in the first place. I find it ridiculous that "Race" even matters anymore. We're just people. We are all "mixed-race," so the category could potentially see a lot of use. Genetic testing shows that all of us are descendants of a single woman who lived around 150,000 years ago (although not necessarily by the same guy, and yes, there were other people around at that time, too, but their descendants died out). Finally, the beginning of the end of segregation in the real world. It's time to become truely post-racial, and have the census departmetn stop asking this silly question. We are all mixed race, it's just a matter of how much. "Hyphenated Americans" was fine while it was Irish, German, Italian-Americans. Now when its Mexican-American or African-American its a sin. For years, America was "united" as long as it was the United White States of America. The people who ran the country, for the most part white, did their best to exclude non-whites. They didn't accept their cultures or their histories and diminished their value as people. Now when these "non-whites" take it upon themselves to show pride in their heritage; a heritage gladly left out by the once white majority, you say that they don't believe in America. More accurately, America didn't believe or accept FIRST. Man you are on point! Some Americans either don't know their history or don't accept it. 'Hyphenated-Americans' is just the same old code and rethoric that has always exsisted in this country. Well said Bryan, well said. So you are saying it has been done wrong all along? The census bureau didn't start collecting housing data until 1940. Anyways, if you know something is wrong (as you implied) , why would you personally continue you to do it? Doesn't sound very intelligent. The ancient Egyptians displayed a process for 'The Carrying of the Eye'. That Eye contained the power to perceive Truth. Truth beyond shape or color, beyond opposing forces, beyond hype and bias. You can see/perceive beyond this mixed puzzle, you can do it. I know you can do it. Are ther really any purebloods? Black and White, really.. This page is black and white, and does not come close to my skin tone. No matter how I mix White and Black, it doesn't make brown or pink. Our country is a melting pot of diversity in race and culture. This is to be expected and not news, lol. Yea and look its not going so well either this gloriuos melting pot!! I prefer a lot more monogomous racial make-up and its a fact people of like kind get along a whole lot better so you can take your melting pot and shove it. Yeah – not really working out too good, is it? The melting pot theory is a failed experiment. Most races of people cant stand the other races no matter what they say in public. Behind closed doors, whites dont like blacks, blacks dont like whites, and Latinos dont like either and vice-versa. Its the way it is. I dont care how goody-goody people make it sound: The talkl at the dinner table remains the same. Sure, there are exceptions but in general most races dislike other races. Ironically, its minorities that tend to hate whites even more than the other way around. They get away with it though. Sorry to rain on the diversity parade but it is what it is. Mike, true Sociologist you are (Enter sarcasm here). I check all of them now. It's the glamour of it that I think has caught on. So many film stars and supermodels are from a multi-race/multi-ethnic background. It's that accessibility and mass appeal that casting and booking agents look for. So, the result is that more Americans, who are always trying to define themselves in "special" ways, see the glamour in identifying in multi-race categories and want to be part of that. I have a friend who is barely an 8th Cuban, but she strongly identifies as a "Latina". Personally, I see no downside to an America that will eventually look collectively like Keanu Reeves, Derek Jeter, Selena Gomez and Jessica Biel. It will be a very, se-xy place. Cuban or Latina is not a race. You can have white Cubans like Cameron Diaz, Andy Garcia or Eddie Cibrian and plenty of black Cubans too like the baseball players or even Asian or Jewish Cuban. Most Latinos I know are TOTALLY white. Argentina is whiter than the USA!! Cool, does that mean people will stop getting government sponsored privileges to enter college? LOL...is that the best you got? Another fine example of how regressive our Government is. The ability to deny reality must be an American trait. In light of DNA evidence and fossil remains, a person, or group of persons, that can see the origins of humanity, and simultaneously deny those origins in favour of their current skin tone, has to be quite regressive in order to put out a form for people to report their condition on based on inaccuracies and out-and-out falsehoods, and then report it as "demographics" fully knowing that it is a distortion of the facts. Case in point, there was a television program in which DNA samples were collected and analysed and there geographic origins were revealed in stages. For the most part, and unbeknownst to most participants, the results swirled about the map of the world and ultimately ALL returned to one area of very close proximity, Africa. Well, that sort of makes us all Afro-American, doesn't it? Good point. You are speaking of tracing the midochondrial DNA which is carried by the mother. Yes, every human's ancestors migrated out of Africa at some point. But don't forget there were others that we may have mixed with – even back then. Neanderthal for instance. They were a contemporary of cro-magnon man and it has been recently discovered that traces of neanderthal DNA has been found in some living humans today. Yeah, and they all starred and/or made guest appearences on "Jersey Shore." Aron, I'd be very careful about ancisucg GG about having any link with Iraq's oil for food programme.He's made some very robust defences against accusations of impropriety and frequently resorts to court action to defend his reputation.If I were you I'd either cite some evidence or prepare for a knock on the door.Perhaps the mods might want to think about this as well.After all, George has been accused of many things but I've never seen him linked to global warming before. I come from a mixed marriage; my dad's male and my mom's female. Mars & Venus – lol. I'm half Aryan, half Jew. Every time I witness the insanity of war I want to stick my head in the oven. i find that whole box checking thing a huge waste of time. Get rid of affirmative action! You better hold on to affirmative action dude. The demographics are changing rapidly, soon your whiteness, you will be in the minority. In 2050 America, less than 40 years from now, the "in" look will be to look Chinese. Because by that time China will be the ruling super power of the world. So mommas, don't let your daughters grow up and marry anyone but an asian. The only reason why affirmative action ever existed is because you good 'ol boys didn't want any person of color to infiltrate your ranks. You started doing this after the Emancipation Proclaimation freed millions of slaves who, after 400 years of doing all the labor, were now the most qualified to go into cities and get all the jobs. Labor unions were established and European immigrants were invited in to help prevent the freed slaves from getting jobs. Actually I am all for this. With more people identifying as black, their overplayed race card is finally getting worn out plus with some white and Asian genes injected into that tepid pool, some of them will actually do something with their lives – like become president! Despite this, I would still never let my daughter marry a black guy – LOL! Better my white daughter marry a good black man who will treat her well than a white redneck one that will beat her down. You cannot judge a person's character by their skin color. And if you can't get past how different someone looks than you, how will you ever get to know some of the truly amazing people in your world? Why limit your humanity that way? You're a good person – love your post! I have three daughters and that has always been my stand. Good for us. Yep! HAW HAW HAW *spitooey! * *scratch scratch* Gud wun, Konrad! A'tll show 'em! Whites have the best skin tones, hair and features. Blacks have the behind, only. Asians, by statistics, are the smartest. Hispanics have no specific "look." I guess those women who are having their lips injected never got the memo about your opinion. yeah, whites have the best skin tone...... Whites don't even believe that because if you did, you wouldn't be running to tanning beds and beaches trying to darken your skin like blacks and hispanics. Every summer its the same thing. Some white person will come up and say "I'm almost as dark as you...heh heh". Is that why Whites Tan to look like hispanics and blacks which both have the lovely skin tones!! Most Hispanics I know are WHITE!! They also come in blacks, Asians and Jews and plenty of brown Native American Indians. I'm sure many people don't realize the extent to how mixed their ethnicity is. I'm sure in reality these numbers are much higher. I agree. But when people self-identify in this manner (on a survey) they may say that if their own parents didn't call themselves mixed race it means that they aren't either. Hey Smart Black Guy, What are you talking about? Do you care to elaborate? If you're really smart like your name implies explain yourself. You should stop generalizing people. If you even know what that means. Gee, that's odd, I prefer the term multi-ethnic since genetically there is only one race of human. I am an old mulatto and have always believed we would take over America eventually. Statistical evidence is abundant; a new world is coming soon, maybe even before I move along. Its not race, it is ethinicity, the race is human. Actually, it is race. Human is a species. Learn your stuff. Err... Professor??? ...the previously held concept of three races of humans has been dismissed by the academic community for many years... there is only one race and one (living) species (as proven by DNA). Nope, the professor is correct. As much as I hate mixing genetics and race due the controversy and ethical issues, not all populations of humans have the same hominid ancestry (ie Neanderthal ancestry is limited to Europeans, Denisovan ancestry limited to Australian aborigines). Even though we've all got different ancestry, we're all human beings, though. Scientists everywhere have reject the theory of race for decades. It's taking forever for the US Government to get its thinking out of the 19th century. Legal recognition of the existence of 'races' is the surest way to enable the practice of racism. Perhaps it is time to eliminate the check boxes and begin identifying ourselves as American. Well said. I've go even further and saw we should eliminate all race based aid as well. Yea race based aid isn't needed, it's not like a large percentage of Blacks live in ghettos. People who argue for this do it because they hate to see their tax money helping black people or people of other races than their own, or they want to keep other races left behind so that white can always dominate. Hate to break it to you but America will one day no longer be white. I would bet that in the south parts of America will attempt to secede and form their own white nation through violent means. White people will be the downfall of this country because alot of them just refuse to unite with their fellow man, they think they're the perfect race. Um, the census doesn't just track Americans. It tracks everyone living here.